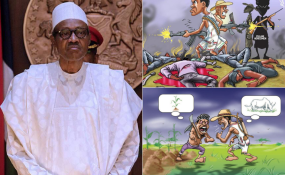 Buhari summoned over farmer-herders killings in Nigeria. President Muhammadu Buhari on Tuesday led other leaders of the All Progressives Congress to Ado Ekiti, the Ekiti State capital, in a bid to ensure that the party's candidate, Kayode Fayemi, emerges winner at Saturday's governorship election. "They blackmailing me, saying I have not done anything about the farmers/Fulani herdsmen clashes because I am a Fulani man," the president said. "But this is a cheap blackmail. We are doing everything to curtail the situation, and provide a lasting solution to the problem." Mr Buhari was apparently referring to the campaign stunts of the Peoples Democratic Party, branding the APC's federal government as irresponsive to the herdsmen/farmers clashes. He also told the crowd in Ekiti to vote on Saturday and look beyond "stomach infrastructure." Stomach infrastructure is Mr Fayose's policy on providing welfare directly to indigent people of the state. "Do not allow your future to be insulted by stomach infrastructure," Mr Buhari said. "Vote on Saturday, looking beyond stomach infrastructure. "Don't waste your votes, vote for Dr Fayemi. I know Ekiti people cannot be brainwashed or deceived." "I am not here to only campaign, but also to urge the people of Ekiti State to embrace change," he said. "The party stole all the money in the treasury. They ate the breakfast of the children," he said. "Prices are up, yes, we agree, but who stole all the money. The PDP is a party of destruction. When they ate the tail and brain of the yam, where are they going to get the yam for lunch?"